Sixth-century Art and Architecture in “Old Rome”: End or Beginning? Hagia Sophia in Constantinople, or the mosaics of San Vitale in Ravenna, are highpoints in the architecture and art of the sixth century. Yet this was also an important time in Rome, for while the ancient city fell into ruins, the popes continued to provide new, beautifully decorated churches, and elaborate liturgical furnishings. Some important buildings and works of art from the period survive; others are known only from written accounts. This study will focus on some aspects of the physical decline of the ancient city and then examine some examples of papal artistic patronage. Rome, once the capital of the Roman Empire, had by the sixth century declined in political importance. The emperor resided in Constantinople, while Italy was governed from Ravenna. In the reign of Justinian, the imperial army under Belisarius and Narses waged war against the Goths in Italy. Rome was besieged in 536-537, 544, 546-547, and 549; in 552 Narses finally secured the city. After the Byzantine reconquest, in 568 the Lombards invaded Italy; from then on Rome was again surrounded by enemies. For much of the sixth century there was continuous warfare. Although this was not a totally new experience after the barbarians had conquered Rome in 410 and 455, it inevitably had disastrous effects on the physical state of the city, which fell into disrepair. Early in the sixth century, when Theodoric visited Rome, he was impressed by the monuments of the ancient city, which he wanted to have restored. His chancellor, Cassiodorus, referred to the Theatre of Pompey, the ruined granaries, the aqueducts, the Walls, even the “splendid sewers”. Rome was then adorned with “a huge crowd of statues, mighty herds of horses”. Procopius, roughly thirty to fifty years later, observed ancient bronze statues attributed to Phidias or Lysippus and to Myron in Rome, as well as a plainer historical artefact, Aeneas’ boat. During the wars of the sixth century, Belisarius as a defensive measure repaired the Aurelian Walls and the fourteen Gates of the city and Narses built a new bridge, the Pons Nomentanus. At that time, however, many of Rome’s monuments and works of art perished. Procopius claimed that Totila intended to raze Rome to the ground in 546, when he destroyed about a third of the city’s defences; he also reported with characteristic exaggeration that Totila “was on the point … of burning the finest and most noteworthy of the buildings and making Rome a sheep-pasture”, when Belisarius sent his envoys to intervene. Rome suffered from both the Goths and the Byzantines. In 537 the Goths cut the aqueducts, including the one which fed the mills on the Janiculum. Procopius explained that as a result the Romans could no longer take baths as of old, “because of the scarcity of water”. Perhaps it was at this time that the great Roman thermae and the smaller balnea fell into disuse. Belisarius also had to arrange for corn to be ground by mills in the River Tiber. (Such mills continued to be situated in the river till the late nineteenth century.) On the other hand, enough drinking water was available from wells in the city for Rome’s shrinking population. … a most noteworthy sight. For it is made of Parian marble, and the stones fit closely one upon the other having nothing at all between them. And it has four sides which are all equal, each being about a stone’s throw in length, while their height exceeds that of the city wall; and above there are statues of the same marble, representing men and horses, of wonderful workmanship. … knew not what means of defence they should employ to save themselves, but afterwards by common agreement they broke in pieces most of the statues, which were very large, and taking up the great numbers of stones thus secured, threw them with both hands down upon the heads of the enemy, who gave way before this shower of missiles. In this way the fine marble statues were destroyed and the Mausoleum was used as a fortress, which it remained throughout the Middle Ages and beyond. Pelagius’ successor, Pope Gregory the Great, organised a sevenfold litany to implore God’s mercy on the city. The clergy, the monks, the nuns, the children, the laymen, the widows and the married women set off in procession in separate groups from seven churches in the seven ecclesiastical regions of Rome, together with the priests of each region, to converge on the basilica of S. Maria Maggiore, chanting Kyrie eleison, while choirs sang the psalms. The pope preached conversion and penance, at seeing his flock “struck down by the sword of the wrath of God”. According to a tradition of uncertain date, during the sevenfold litany the Archangel Michael was seen above the Mausoleum of Hadrian, placing his sword back in its scabbard; presumably this signified that the wrath of God was placated. In the early seventh century an oratory dedicated to St Michael was built atop the central cylinder of Hadrian’s monument. It became Castrum S. Angeli, Castel Sant’Angelo. Whether the story was true or not, a profound change had come over the ancient building and its significance for Rome. In a similar way the great Hadrianic pagan temple, the Pantheon, was transformed into a church in 609. All this was symptomatic of the end of an era, and of a new beginning. When one reads graphic accounts of destruction in Rome through war, natural disaster and disease, one seems to witness the end of the grandeur of ancient Rome and the beginning of the Dark Ages. Yet, as the ancient city fell into ruin, Rome continued to hold her own, for Rome was more than just the former capital of the Roman world. By the sixth century Rome was a holy place, the city of St Peter, leader of the apostles, and the See of his successor, the pope, who had his cathedral and palace at the Lateran. It was the city where the Apostle Paul had lived, suffered martyrdom and been buried. Outside the walls were the graves and shrines of many martyrs, like Saints Lawrence, Sebastian, Agnes and Cecilia; in the fourth and fifth centuries small suburbs had grown up around them, with basilicas, oratories and monasteries. The Church was a powerful force in Rome. Gradually during the sixth century and later, the government of the city, while officially in Byzantine hands, in practice devolved on the pope and the papal bureaucracy. (One notes that it was the “papal granaries” which were flooded in 589; by then feeding the populace had become part of the Church’s diaconia, or welfare service.) The Church looked after the poor, the sick, and the old, as well as the pilgrims who came to pray at the sanctuaries of the apostles and martyrs. At the end of the sixth century, through the evangelizing efforts of Pope Gregory the Great (590-604), new barbarian peoples of the West, like the Anglo-Saxons, were converted to Christianity and they adopted the Roman liturgy and other practices, so that Rome became the centre of Latin Christianity, which she continued to be throughout the Middle Ages. In this perspective, it is interesting to examine the role of the sixth-century popes as patrons of art and architecture in Rome. One finds that in this they both continued the policies of their predecessors, and introduced significant new features to the churches and monasteries in and around the city. The sixth century opens with the pontificate of Symmachus, who came to the papacy in 498 in a dispute election, later ratified by Theodoric. The Liber Pontificalis gives a long list of the pope’s building projects in Rome, which unfortunately do not survive. Symmachus appears to have emulated the great papal patrons of the fifth century: Popes Innocent I, Boniface I, Celestine I, Sixtus III, Leo the Great, Hilarus and Simplicius. In the fourth century, from the time of Constantine, the emperor was the greatest patron of church architecture in Rome. From the fifth century on it was the pope who oversaw church building projects. In the first place Pope Symmachus concentrated on the basilica of St Peter and its surrounding structures. Beside St Peter’s he laid out the church of St Andrew within an existing rotunda, which had probably been built originally as a family tomb. The plan was similar to that of another rotunda attached to the transept of St Peter’s. In the church of St Andrew there were seven oratories, dedicated to Saints Andrew, Thomas the Apostle, Cassian, Apollinaris, Sossius, and perhaps Lawrence and Vitus. Pope Symmachus provided the main altar and all the oratories with a confessio and an arch of silver. Outside the church of St Andrew the pope laid out an atrium, with a fountain in the middle. To the baptistery in the transept of St Peter’s Pope Symmachus added oratories of the Holy Cross, St John the Baptist and St John the Evangelist. Their dedications recalled the oratories attached to the Lateran Baptistery by Pope Hilarus in 461-468. Pope Symmachus was probably alluding to that programme. He also provided a cross of gold, studded with gems, to hold a relic of the True Cross, which he placed in his oratory of the Holy Cross. Pope Symmachus beautified St Peter’s basilica itself with marble, perhaps opus sectile revetment, similar to that which survives in the basilica of S. Sabina or in the narthex of the Lateran Baptistery, from the time of Pope Celestine I (422-432) and Sixtus III (432-440). He decorated the quadriporticus in front of St Peter’s with lambs, crosses and palms in marble and mosaic, but it is not clear where exactly this decoration was. In the atrium he set up a fountain. It was made of a large ancient Roman bronze pine cone, through which the water spouted, to fall into a rectangular basin surrounded by ancient marble plaques decorated with pairs of gryphons facing each other on either side of a candelabrum; around this stood eight porphyry columns supporting ionic capitals and an ornate canopy adorned with bronze peacocks and dolphins. This was drawn in 1539-1540 by Francisco de Hollanda; it stands in the foreground of G.A. Dosio’s drawing of St Peter’s, c.1560, but by then the marble plaques had disappeared. Pope Symmachus also paved the atrium and built steps up to the basilica. At St Peter’s Pope Symmachus erected two palace buildings, perhaps reception rooms, one on the left and one on the right of the basilica, for the bishop of Rome. While the main papal palace still stood beside the Lateran cathedral on the other side of town, Pope Symmachus was the first pope to build an official papal residence at the Vatican. He also established houses for the poor at St Peter’s, St Paul’s Outside the Walls and at St Lawrence’s tomb. 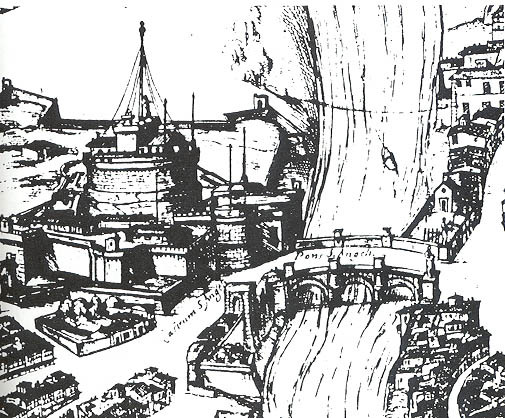 For pilgrims he provided a lavatory and a fountain, in the rough square in front of St Peter’s atrium, the Platea Sancti Petri, which can still be seen in the Du Pérac-Lafréry map of Rome of 1577. At St Paul’s Outside the Walls Pope Symmachus renewed the apse, which was threatening to collapse. He adorned the space behind the confessio with a painting – in this he continued the decorative programme of Pope Leo the Great (440-461). He also set up the vault and the matroneum. Over the confessio he placed a silver image of the Saviour and the twelve apostles. He built steps in front of the entrance to the church and in the atrium he placed a fountain. He brought water behind the apse and built a bath, or perhaps a baptistery, from the foundations, but its precise location is unknown. Along the Via Aurelia just outside Rome Pope Symmachus built the basilica of St Pancratius, in which he placed a silver arch. He built another bath, or baptistery, at the same place. One notes that Pope Hilarus in the mid-fifth century had also built two baths near the church of St Lawrence Outside the Walls. Within the city of Rome, Pope Symmachus dedicated a double sanctuary of Saints Sylvester and Martin, which was replaced in the ninth century by the church now known as S. Martino ai Monti. At Saints John and Paul, where the clerestory walls of the fifth-century basilica survive, he built steps behind the apse. He enlarged a church of St Michael the Archangel – of unknown location in Rome – built steps, and brought water to the site. At S. Maria Maggiore he built an oratory dedicated to Saints Cosmas and Damian. From the lists given in the Liber Pontificalis, it is clear that Pope Symmachus was a great patron of architecture. His numerous projects to bring water to churches may have been part of a papal policy to provide for baptism to be administered at the major churches of Rome. According to the Liber Pontificalis, Pope Felix IV (526-530) built the church of Saints Cosmas and Damian in the city of Rome, “in the place called the Via Sacra, next to the temple of the city of Rome”. Here the church survives, though restructured and partially redecorated. It is notable that the building was in the very heart of ancient Rome, laid out within and beside ancient Roman structures; it stands directly behind the early fourth-century domed building known as the Temple of Romulus (built in 309 A.D.), over what was formerly its monumental centre: churches like Saints Cosmas and Damian and S. Maria Antiqua were laid out near the Forum and under the imperial Palace on the Palatine; in the sixth century SS. Quirico e Giulitta was built just behind the Forum of Augustus; in the seventh century the ancient Senate House was turned into a church dedicated to St Hadrian, and another dedicated to Saints Sergius and Bacchus was established in an ancient building nearby. The trend to “Christianize” the administrative and monumental centre of ancient Rome began in the sixth century, and intensified in the seventh. It is noteworthy that many of these churches, like Saints Cosmas and Damian, Hadrian or Sergius and Bacchus, were dedicated not to saints of Roman origin, but to those from the East, from the Byzantine world. The way one sees the church of Saints Cosmas and Damian today is determined by later restructuring – the floor has been raised and chapels have been inserted on either side of the nave. Originally there was a long rectangular hall with an apse at the end. The apse and its surrounding arch were decorated with mosaics. In the centre of the apse Christ, dressed in gold and holding a scroll like an ancient orator, is pictured at his Second Coming, against a deep blue sky and reddish clouds. On either side on the earth below stand Saints Peter and Paul, dressed in white; they present the patron saints, Cosmas and Damian, dressed in gold and purple, to the Saviour. Saints Cosmas and Damian were physicians, who also healed miraculously by the power of prayer. In the apse they each hold a red bag, perhaps an allusion to their medical profession, since they did not take money for their services. Beyond them on the right stands St Theodore, wearing his Byzantine cloak and tablion. On the far left there was an image of the patron, Pope Felix IV, but this figure was almost totally reworked in 1632 by Pope Urban VIII, whose Barberini bees appear at his feet. Behind St Theodore and the pope grow palm trees, which were associated with paradise in early Christian art. In the branches of the one behind the pope sits a phoenix, a symbol of the resurrection. While Saints Peter and Paul acclaim Christ and present the patron saints to him, Saints Cosmas, Damian and Theodore offer crowns, symbolic of their victory in martyrdom. Above the figure of Christ there was originally another, larger crown held by the hand of God the Father; it can be seen in early drawings. The saints stand on the banks of a river, labelled Jordan. Below them is a frieze of twelve sheep walking towards the centre, where the Lamb of God stands on a hill, from which flow the four rivers of paradise. Below the frieze is the dedicatory inscription written in gold letters against a dark blue background. The figures are strongly modelled, the composition symmetrical. Framing the apse is an image from the Apocalypse, with the Lamb of God enthroned, with the scroll with the seven seals, in a central roundel, flanked by four angels, the seven lampstands of the seven churches, and traces of the winged creatures and of the four and twenty elders. The background is gold, not blue. The composition has been cut by the later structure of the side chapels. In the life of Pope John II (533-535) the Liber Pontificalis records only a number of liturgical vessels offered by the Emperor Justinian to the Apostle Peter. There is no mention of the work done by the pope himself. Yet, there are some interesting liturgical furnishings associated with him, starting before his pontificate, when under his own name, Mercurius, he was the priest of San Clemente in Rome. Incorporated in a fifteenth-century tomb in the basilica there are two Roman half-columns, decorated with ivy and birds, very like the columns found in some Pompeian gardens, or in some ancient Roman candelabra stands. At the base of the half-columns there are some acanthus leaves, like those one sees in some ancient Roman paintings. These half-columns appear to date from the late first or early second century A.D., but they were reworked in the sixth century, as can be seen from the style of carving in the acanthus leaves, which is typical of work done in Constantinople at that time. Above one of the half-columns is a capital with an inscription saying “The priest Mercurius, servant of the Lord, offers this to the holy Catholic church”. The style of this capital and of the one above the second half-column is again Byzantine, but they are both made of Italian marble. Perhaps they were carved by Byzantine sculptors in Rome shortly before 533, when Mercurius became Pope John II. The priest Mercurius, later Pope John II, also donated the marble plutei and transennae which now make up the medieval choir and sanctuary screens in San Clemente, as another inscription reused under the medieval ambo indicates. The monogram of Pope John is also found on some of the marble plaques, showing that they were completed after 533, when Mercurius became pope, and took that name. There are now roughly twenty-one sixth-century marble plaques and three transennae, as well as thirty-two small piers, in the church of San Clemente. They were brought up from the lower, early Christian basilica in the beginning of the twelfth century, when San Clemente was rebuilt on a higher level. Needless to say, they are not in their original arrangement. The transennae are decorated with a basket-weave design. There are four main decorative schemes carved on the plutei: one with an eight-pointed star in the middle, between two rhomboids; a tripartite schema with ribbons and crosses on either side; a pattern with two squares placed diagonally; and a simple division into two rectangles containing disks and crosses. These patterns are carved on both sides of the marble plaques, which are framed by a simple triple moulding. Comparable designs were used in other sixth-century church furnishings in Rome, for example at Saints Cosmas and Damian in 526-530 and in the choir of St Peter’s, probably remodelled under Pope Gregory the Great; similar work also survives at Hagia Sophia in Constantinople, especially in the balustrades of the upper galleries. Once again there are signs of Byzantine influence; one assumes that Byzantine craftsmen were working in Rome. It is not clear where all this liturgical furniture was originally placed in San Clemente. Probably there was a solea, or processional pathway, down the centre of the early Christian basilica, along which the bishop of Rome and his accompanying clergy walked on their way to the high altar to celebrate Mass. Tom Mathews suggested such an arrangement some years ago and Federigo Guidobaldi has made a new, tentative reconstruction of it. Recent excavations under the structures north of San Clemente have revealed a fifth-century baptistery adjoining a sixth-century Secretarium. The latter was there when the pope vested, before making an impressive entry into the basilica for Pontifical High Mass. It may have been built by Mercurius, later Pope John, when he endowed the church with liturgical furnishings. During the Gothic wars there was hardly any church-building in Rome, as one might expect. After the Byzantine reconquest was assured, the Liber Pontificalis records further papal patronage. Pelagius I (556-561) began to build the church of the Apostles Philip and James. This was close to the Markets of Trajan; the basilica has been rebuilt and is now known as SS. Apostoli. Pope Pelagius II (579-590) is best remembered for the basilica he constructed over the tomb of St Lawrence, at St Lawrence Outside the Walls. This church originally had its apse in the west, and its floor right down in the catacomb on the level of the martyr’s tomb, but it rose high into a nave with galleries and an inner narthex. The building materials were mostly ancient Roman spoils: fluted columns, varied architraves, even military capitals. The result was so fine that a seventh-century pilgrims’ guide referred to the church as “the new basilica of admirable beauty”. In the early thirteenth century the apse was torn down, and a new nave and narthex were built in the west, while Pope Pelagius’ basilica was transformed into the sanctuary of the medieval church, now situated in the east. A basilica with galleries was more typical of the Byzantine world than of Rome; it was also a practical solution to allow pilgrims coming to the tomb from the nearby hill to walk in at gallery level to view the tomb from there, without having to descend into the dark corridors of the catacomb. This new device was used again at the tombs of Saints Nereus and Achilleus in the catacomb of Domitilla c.600, and in the church of St Agnes, built by Pope Honorius I in 625-638. Although the apse of St Lawrence Outside the Walls was demolished in the thirteenth century, the mosaics of the apsidal church survive. They show Christ, dressed in purple and gold, in the centre, enthroned on the universe, blessing and holding a cross. He is flanked by Saints Peter and Paul, who acclaim him. Beside Saint Paul stand Saints Stephen and Hypolitus, the former holding a closed Gospel book, the latter offering a crown. Beside St Peter stands St Lawrence, who holds a processional cross and an open Gospel book, both alluding to his office as deacon. He is next to the patron, Pope Pelagius II, whom he is presenting to Christ, and who offers the Saviour a model of the church. Below the windows at either end there are images of the jewelled cities of Jerusalem and Bethlehem. When one compares the mosaics at Saints Cosmas and Damian, built in 526-530, with these Pelagian mosaics, one sees a change of style, with much less modelling in the later work. This trend continued into the seventh century, as can be seen in the figures in the apse mosaic at S. Agnese, made in 625-638. Pope Pelagius II was also responsible for some changes at St Peter’s. He surrounded the tomb of the apostle with gilded silver. At his time an annular crypt was built under the apse of St Peter’s, to allow the faithful to approach the venerated place, say a prayer and pass on. Like the gallery basilica built at St Lawrence Outside the Walls, this was a new solution to channel the flow of pilgrims in an orderly manner. Pope Pelagius also built a home for the aged poor. At St Peter’s his successor, Pope Gregory the Great erected a ciborium on four columns, all made of pure silver, and he arranged for Mass to be celebrated over the tombs of Saints Peter and Paul. He dedicated the Roman church of S. Agata dei Goti. Gregory, to whom we owe the earliest life of St Benedict, was attracted to the monastic life himself. He established a monastery in his family home on the Celian Hill, where he spent several years as a monk. He regretted having to leave the peaceful, prayerful life of his monastery for the task of governing the Church, but having been both City Prefect and Roman ambassador to the imperial court at Constantinople he was well suited for the job. Again, little remains of Gregory’s monastery, which was on the site of the church now dedicated to him and in three halls nearby, which were remodelled in 1602. The buildings were described by John the Deacon, Gregory’s ninth-century biographer, as having chapels dedicated to Saints Barbara and Mary, an atrium, monks’ cells, stables and a cellar. Earlier popes had founded the monasteries in Rome – the Liber Pontificalis mentions several in the fifth century. Yet it was Pope Gregory the Great who recognized the potential monasticism had for spreading the Gospel in the world in which he lived. He entrusted the mission to convert the Angles and Saxons in England to monks. Many holy hermits, monks and nuns appear in his Dialogues, his biographies of the saints in Italy in his day. Monasticism, indeed, became one of the most important elements in medieval Christendom. It is not surprising, then, that the pontificate of Gregory the Great (590-604) marks a significant point of transition. By his time, through the trials of the sixth century, Rome had seen the world of late antiquity come to an end. A new era the Middle Ages, was beginnings.